One of most recognizable and consistently fashionable gemstones, turquoise has been around (arguably) since about 6,000 BC. Adorning everything from cathedrals and kings to present-day celebrities, the sky-blue stone has been a status of wealth, a health talisman and a fashionably chic gemstone. Over the years, the prized ornamental stone has been used by many ancient civilizations but made its notable entrance into western civilization through Persian and Egyptian Turquoise. Historically, Persian Turquoise came to describe the fine robin’s-egg or celestial blue color stone with no visible matrix—meaning that the stone lacked the black or brown veining commonly found in turquoise mined in the United States. These veins in the gemstone are caused by a lack of iron and little vanadium. Turquoise that lacks this matrix was and is considered the most admired type of turquoise. 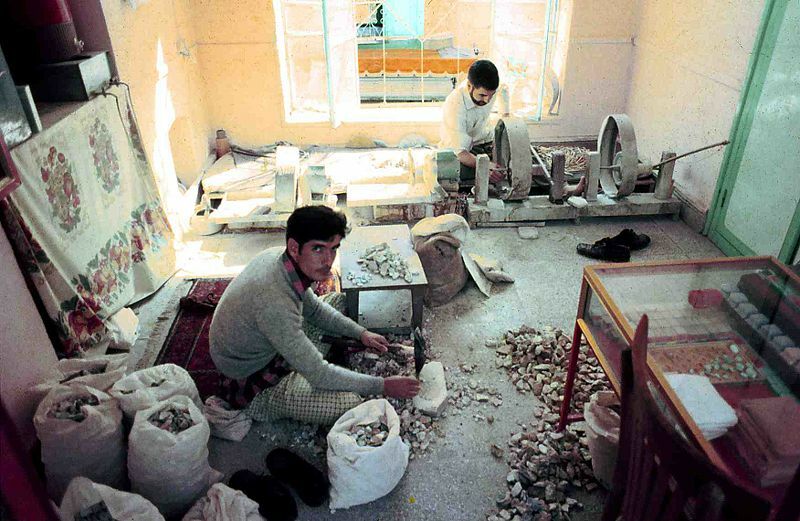 Persia is known to have some of the world’s oldest Natural Turquoise mines in the world. Perhaps the first type of turquoise that was introduced into western culture through the Silk Road, Persian Turquoise became available to Europe, Western Asia and America coming from cities like Tous, Neishapour, Damghan, Grogan, and Baghdad among others. When the rare turquoise was brought into Europe around the 16th century, people who usually spoke Chinese, Persian, Turkish or Arabic carried the stone. The word turquoise was coined when Persian Turquoise was brought from Turkey mines in historic Khorasan, a province of Persia. In the Persian Empire the gemstone was worn around the neck or wrist as protection against unnatural death. If the gemstone changed color the wearer was thought to have reason to fear the approach of doom. It was also believed that reflection of a new moon on turquoise brought luck and guarded against evil. Some also believed that looking at the stone could sharpen eyesight and placing it on an inflamed eye was considered to be a cure. The ancients believed that turquoise indicated its owner’s health, turning pale at the time of illness and losing color at the time of death. Once the stone was given to a new and healthy owner the stone regained its original beauty. We now know that the stone can change color depending on light, chemical reaction, dust or acidity of the skin. Egyptian turquoise has also played a large role in Western culture. Dating back to the first Egyptian dynasty, Egyptian turquoise was used for many purposes including jewelry and ceremonial objects. Egyptians prized turquoise as a life stone. Historical documents show Egyptian Queens wearing bracelets made of gold and turquoise including the bracelets found on the mummified Queen Zar; these bracelets are argued to be the oldest pieces of jewelry. Like the Persians, Egyptians saw the gemstone as a symbol of prosperity. Turquoise was so popular in ancient Egypt that it was often referred to as “the peoples’ gemstone.” Considered to be a metaphysical stone, natural turquoise was associated with the goddess Hathor who was the goddess of joy, feminine love and motherhood. When large Egyptian turquoise mines were exhausted, the gemstone became one of, if not the first gemstone to be imitated by using a glazed earthenware product known as faience. Before the imitation turquoise, Natural turquoise was altered into stabilized turquoise by using oil or wax so the stone could be used for jewelry. Jewelers still stabilize turquoise using more modern-day methods of inorganic mineral salts such as colloidal silica and sodium silicate. Stabilized turquoise makes the stone more durable and less likely to absorb the elements that changes the stones color. Stabilization serves as a protecting seal. Although the stabilization process can darken and saturate the stone’s color, it does not drastically alter the stone. The impact turquoise had on the Egyptian culture carried over into Western culture when, in the 1920s, turquoise re-emerged with the discovery of King Tutankamun’s tomb. Within the burial site was the iconic gold burial mask of Tutankamun inlaid with turquoise. Also discovered within the tomb were several other turquoise inlayed pieces. The discovery was such an influence that the turquoise trend rolled over into Western jewelry, architecture and art. It is through these two powerhouse civilizations that turquoise was introduced, mined, refined and even imitated. And whether or not turquoise was the first gemstone to be used in jewelry, it is clear that this stone was both fashionable and practical before ever making its début into modern-day use and ware. Copyright © The History of Turquoise Mines 2019. All Rights Reserved.